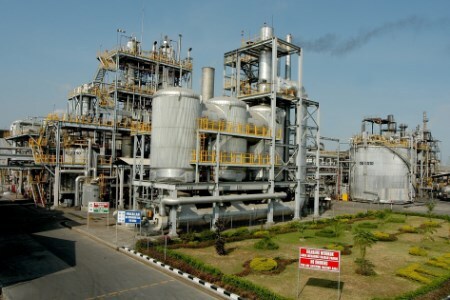 Clariant has announced the successful start-up of its new high-yield OxyMax PA 690 catalyst at Petrowidada’s world-scale phthalic anhydride plant in Gresik, East Java, Indonesia. After an industry-standard ramp-up time to a high ortho-xylene load of 100 g/nm³, the production facility reports significantly greater yield for the first nine months of operation. The highly favourable results demonstrated at the Petrowidada plant are due to the unique design and materials employed in the new catalyst. OxyMax PA 690 is a shell-type catalyst which is produced using Clariant’s proprietary fluid-bed coating technology. In the process, the catalytically active materials titaniumdioxide and vanadium-pentoxide along with special promoters are coated in a thin shell on ceramic rings. The thin, porous shell resolves mass and heat transport challenges during selective oxidation of ortho-xylene to phthalic anhydride (PA). Hence, over-oxidation is reduced, and unwanted by-products, such as carbon oxides and maleic anhydride, are minimised. The shell, combined with an improved catalyst composition and optimised mass transport properties, results in excellent selectivity and up to 116 wt.% reactor outlet PA yield – a performance that is unprecedented by previous catalyst generations. Thanks to its unique composition and formulation developed in a multi-year R&D project, the new catalyst series has been granted two patent families. It is the result of instrumental research and development performed by Dr. Gerhard Mestl, Head of Oxidation Catalysts R&D at Clariant, and his team. For his pioneering work in applied selective oxidation, Dr. Mestl received the prestigious Applied Catalysis Award from the European Federation of Catalysis Societies (EFCATS) in 2017. Petrowidada is one of the largest producers of phthalic anhydride in Southeast Asia and the sole producer in Indonesia. The company’s world-class plant in East Java has successfully used previous generations of Clariant’s high-ortho-xylene-load PA catalysts since 2007. With OxyMax PA 690, the facility has experienced an increase in overall plant yield of 1 wt.%, and benefits from excellent PA quality with low impurity levels at the reactor outlet. Considering the plant’s annual capacity of 70 000 t of phthalic anhydride, the productivity afforded by the new catalyst translates into considerable benefits for the producer.